Well, that’s the end of the Ten Days of Twitter! I hope you enjoyed it, and that you are now tweeting confidently and productively if you were a beginner, or that you reviewed your practice and picked up a few hints and tips if you’d tweeted before. It was great to see so many people with experience of Twitter offering help and advice too- a fantastic demonstration of how Twitter can be a powerful learning network for professional development! If you’re still catching up, don’t worry! The materials will remain online here for you to work through in your own time, and hopefully those who have already completed the course will be around on Twitter to offer support, advice and company! So where will you go from here? Have you decided that Twitter isn’t for you (and at least now you can make that decision on an informed basis! ), or will you keep tweeting and taking part in the discussions such as #PhDchat and #ECRchat? If you need more help with using Twitter, the site’s own support pages are a good introduction to the various things it can do. Or if you google your question or search on Youtube for video tutorials, you’ll also find that there are a host of resources that people have made and uploaded to help others. But perhaps best of all, your Twitter network itself is a great place to ask questions and find people who can answer them, as we’ve found on this course! Ten Days of Twitter was a new format which we’ve developed and piloted. We’d really appreciate your views on the programme, so that we can improve future versions. Whether you’ve been participating actively in the programme or have been ‘lurking’ and just reading the posts, we’d really like to hear from you. If you would like to contribute your feedback, please fill in the questionnaire below. If you can’t see the embedded version of the form on this page, then you can also click on this link to view it. If you’re choosing who to follow effectively, then your Twitter feed should be full of interesting tweets and links to webpages etc which you might want to follow up on. It’s easy to lose track of it all, miss things and mislay things! When you want to look at your favourited tweets, you will see them marked in your Twitter stream, but it’s easier to see them all together. If you click on the top tab with the profile icon and ‘Me’, a menu will appear on the left, with ‘favourites’ as well as your tweets, followers and following. Click on ‘Favourites’ to view.When you favourite a tweet, the person who tweeted it is notified, which may help to gain you an extra follower, but it also gives them feedback on what others are finding useful. You can also search for tweets, by username, hashtag or just by a keyword. The search box is at the top of the screen in the right hand corner. You can also organise the search results by top (most popular) topics, all results, or limit the results just to the people you follow. Once you have searched, a small ‘settings’ cog icon will appear next to the ‘search’ box (not the main cog icon at the top right of the screen!). If this is a search you might repeat regularly, click on this, and you can save the search so you don’t need to keep performing it. You could also perform an advanced search using this icon- you can narrow down the tweets you’re looking for by word or by the person sending or receiving it, or by location. If you explored Tweetdeck yesterday, you may not have realised that not only can you add columns for lists of people, you can also add columns to follow hashtags. Click on ‘Add column’, and then choose ‘Search’. If you perform a search for a hashtag, you can add a new column to your Tweetdeck which will now display all the tweets using that hashtag, whether you follow the people using it or not. This might be useful if you are following a conference hashtag or chat such as #PhDchat but don’t want to follow all of the people tweeting with this hashtag. Pocket is an application which saves any webpage for you to look at in more detail later, when you have time. It is a bookmarking tool -if you find a webpage via a link in Twitter (or anywhere else), you can save it to Pocket, and then return to it and the other things you’ve saved later on. Pocket is a web browser based service, meaning you can access it from anywhere and any device or computer. To create an account, you’ll simply need an email address, username and password. On your desktop computer, you can download and install it into your browser, so you can simply hit a button in your toolbar to save a webpage (how to install it depends on which browser you prefer to use, but Pocket will take you through the steps – it’s easy!). When you use Twitter in a browser with Pocket installed (and also if you have installed the Pocket app on your smartphone or ipad), then a ‘Pocket’ option appears alongside the other options of ‘reply’, ‘retweet’, ‘favourite’ etc when you hover over a tweet containing a link, so you can save it right from the tweet instead of having to open the link and add it to Pocket from there. You can also access Pocket on the web, if you’re on a computer which isn’t yours, or where you can’t install it into the browser. If you use a smartphone or tablet such as an iphone, ipad or Android device, you could download an app which curates content from your Twitter feed, such as Flipboard. Once you have downloaded the app, you can connect it with your Twitter account (or other social media) and it will draw in the links that people share with you and display them for you. To find out more about Flipboard, and how to set up an account, see instructions in its ‘support’ section. Alternatives to Flipboard are Zite and Pulse. Paper.li is an application which curates content from social media streams which you use (in this case, Twitter, but also Facebook, Google+ etc). It then presents the links it’s found in a easy to read magazine form. You can share this with others (and it will tweet automatically on your behalf, but it is not recommended that you ‘spam’ your followers in this way!) but you can just use it to pick up the links you might have missed on Twitter by adding Twitter as a source. You can create an account and log in to Paper.li using either Twitter or Facebook. Use Twitter in this instance, of course! After that, follow the instructions given by Paper.li. So there are a range of ways to stay on top of all the information that’s being shared with you by the people you follow. Choose one that looks useful to you, and experiment with it! Over the last 7 days, you may have found that as you continue to use Twitter, you come across more and more interesting people to follow and your following grows exponentially. Keeping track of them all can be a challenge, and sometimes you will want to focus on certain groups of them over others, or check in on some people only sporadically. This is hard to do in the undifferentiated stream of tweets on your Twitter feed, where they are all mixed in together. Fortunately, there are ways to split up your Twitter stream and group the people you follow into separate streams, so you can keep an eye on their tweets as it suits you. Twitter has a feature which allows you to make lists of people – and you need not follow all of them to add them to a list. These lists can be private, so only you can see them, or they might be public so you can share them with others. I created such a list for the participants of this course on Day Two, so you could find each other on Day Three. You might create such a list for the benefit of others, for example, to bring together the attendees at a workshop or conference, or the top accounts on a particular topic which you recommend other people should follow. You can share a list by giving people the URL of the list page, or let them view the lists you’ve created on your profile, where they can subscribe to your lists too. To create a list on Twitter, go to the gear icon at the top right of the page. Select ‘Lists’, and you will see a page which will contain any lists you will make. Click on ‘Create list’, and you will be asked to name your new list and add a brief description. This description will be very helpful if you now choose to make the list public, so others can find and subscribe to it. You will now be invited to search for people to add to your list. You can also add them later, by clicking on their @handle and going to their profile. Next to the ‘Follow(ing)’ button, you will see the head and shoulders icon. If you click on this, you will see a menu containing the option ‘add or remove from lists’ (this is also where you can send them private Direct Messages, as in Day 4). While we’re on the topic of managing people, you can also block or report people using this menu, for example, if you are followed by a spam account or someone you don’t want following you. To view your lists, you can simply go to ‘lists’ in the left hand column on your ‘Me ‘ tab, and see only the tweets from the people in that list. The beauty of Twitter is in its simplicity as a platform. However, sometimes you need a bit more functionality. There are some third party applications created by other companies as add-ons to Twitter, to help you out with some of the things about Twitter which you may find a bit overwhelming. Some of them will need to be integrated with your Twitter account to drawn information from them, and to do this, you will need to grant them access to your account (you can revoke this again from your Twitter account settings). Tweetdeck is owned by Twitter, and is a good way to manage more than one account, if you have more than one (for personal and professional use, or perhaps an individual one and an official one on behalf of an institution). It saves you logging out of one account and into another, but it’s easy to get confused and tweet from the wrong one, though! However, you can also use Tweetdeck to split your Twitter stream into columns divided by people. It will import any lists you have made on Twitter too. You can do everything we’ve covered in Twitter on Tweetdeck too, including shortening URLs. Tweetdeck also makes some other things in Twitter a little bit easier. For example, when you retweet, it will ask you if you simply want to retweet or if you want to edit the tweet, as we discussed in Day 6. On Twitter, you need to copy and paste the tweet if you want to edit it; this does it automatically. Hootsuite is similar application to Tweetdeck, but it allows you also to import other social media accounts such as Facebook. You can sign up using Facebook, or if you prefer to keep Facebook separate from your professional social media use, you can sign up with an email address, name and password. It will then ask you to add your chosen social network accounts. You can then add streams of content similarly as in Tweetdeck, and tabs for the different social networks. Hootsuite has a quick start guide to help you set up your account. Think about the kinds of update you’ve seen on Twitter so far from the people you follow. Who do you most want to see tweets from? You might want to try making a list of your colleagues on Twitter, or perhaps one for the professional and funding bodies you follow. You’ve send a few tweets over the last five days – hopefully you’ve found plenty in your everyday routine as a scientist which would be of interest to others, whether they are your peers, other professions such as industry, policy, journalism or publishing, or to the general public. and of course, you‘re displaying to others that you’re well connected to interesting and important people, and that you are a discerning judge of what information is interesting and significant! However, as with sending @messages, if you simply use Twitter’s ‘retweet’ button, you’re missing out on retweeting in the most effective way. The etiquette around retweeting is very much in sympathy with academic conventions of acknowledgement. You can quote the tweet – you can either copy and paste it into your tweet, or if you are using an app like ipad’s Twitter app, they give you the option to quote or just retweet. This makes the tweet come from your account, rather than the original sender, making it clear that it’s you who has chosen to pass this information on. start the tweet by adding a comment of your own, if you wish and if there is room! If you don’t add any comment, then your retweet may be ambiguous – are you endorsing the original tweet? Plus, it may add context, value and character for your followers if you add something of your own. So, to the original tweet, you’ll need to add RT and @name, and possibly quotation marks if you feel you need to clarify any further. Of course, as you only have 140 characters, adding these will eat into the original message! You can, of course, cut out any part of the original tweet you feel is unnecessary, but to signal that you’ve done so, it’s polite to write MT (modified tweet) instead of RT. This is all a good reason to keep your own tweets as short as possible and not use up all 140 characters, so your own tweets can be easily retweeted! You can’t say a lot in 140 characters – but you can link to other places on the web where a topic can be discussed at greater length, perhaps in an article or blog post. Maybe you’ve seen an item of news or a webpage you want to comment on or pass on to your followers. Perhaps you’ve just posted something on a blog or website and you want to encourage people to have a look. Twitter works really well as a way to bring people’s attention to other, longer things online. You can simply copy and paste a website’s URL into a tweet. However, many URLs are pretty long, and even if they fit into 140 characters, it leaves less space for you to add a contextualising explanation or comment which will encourage people to click on the link. Fortunately, Twitter has an inbuilt URL shortener, which will cut the link down to 20 characters. When tweeting a link, it’s good practice to begin your tweet with a brief comment explaining what it is and why you’re tweeting it. A URL by itself doesn’t necessarily say much about content or provenance, and a shortened one using one of the above services gives nothing away at all about what it is. Your followers will ignore your tweet and the link if they can’t immediately see what it’s about, where it’s from and why they should be interested. Moreover, it might be assumed that by sharing a link, you are endorsing the content, so if not, it would be as well to add a comment stating your stance on it – do you agree, or disagree? Or is it simply that you found it useful and think your followers might too? Another reason to keep the URL as it is rather than use a URL shortener is longevity – if that service is withdrawn, the link will no longer work. It’s a trade-off between keeping it short and having some analytics, and longevity and a bit more context in the URL. something you’ve uploaded yourself. This blog is set to update automatically on Twitter whenever I post something new (which is why there is a hashtag in the blog post title!). Try and personalise the automatic update message yourself if you can. your new publication! There’s evidence that tweeting about your research output really helps to increase views, and therefore possibly citations! See what you come across today online, and remember to tweet it to your followers! You’ve sent some tweets, followed people and hopefully gained some followers of your own. Some people prefer to listen more than they tweet, which is fine – the only thing to consider is, the more you say about your interests, the more people will know what kind of information might be useful to you, and direct relevant things your way. It’s a way of fine-tuning your twitter feed as well as providing useful information to others. Giving a talk at your uni next week, @scholastic_rat – are you around for coffee? would be great to meet up! To call someone’s attention to a tweet with an @mention, you use their username or ‘handle’ preceded by a @ sign. 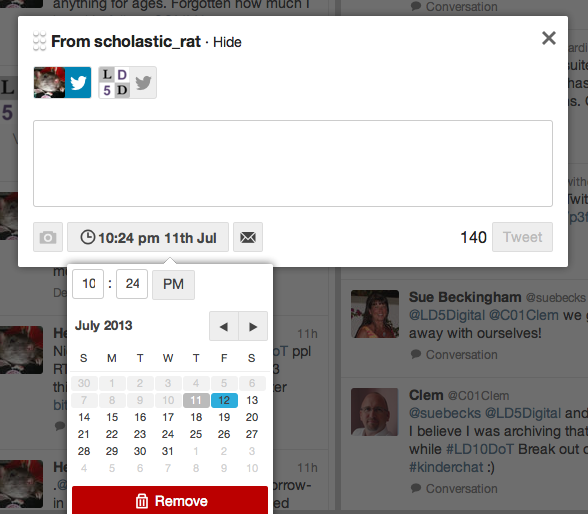 For example, to let me know you’ve mentioned me, you would include ‘@scholastic_rat’ in the tweet. 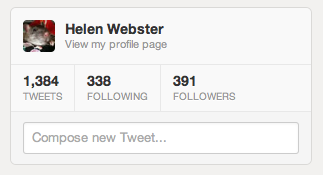 This is another reason to keep your Twitter handle as short as you can – it uses up some of the 140 characters! This is a feature that originated with the users of Twitter, which was then designed into the platform. It’s what has turned Twitter from a broadcast medium of updates into a conversation, and that’s Twitter’s real strength. Note – as the @ sign is reserved for marking people’s handles, you can’t use it as an abbreviation for ‘at’, for example, ‘let’s meet @6pm @cafe’ – it will treat these as an @message, and it’s likely that someone, somewhere, will have chosen @6pm or @cafe as a handle! Of course, there may be times when you don’t want a wide audience to see the interaction, if it’s not going to be understandable out of context, or of interest to them but just cluttering up their feed, and in these cases, you can just start the message with ‘@’. Remember that Twitter is a very public medium, and whether you @message someone or not, your tweets will be visible to anyone who views your profile. If you really want to send a message to just one person, but don’t want it publicly visible, Twitter allows you to send them a DM or Direct Message. To see @messages directed at you, click on the tab marked @ Connect in your profile. They will also appear in your Twitter stream, but you may miss them there! Depending on your settings, you can also receive an email when someone @messages you. So- send some @messages to people you follow- ask them a question, comment on something they’ve tweeted! And send me (@scholastic_rat) an @message with the hashtag #STEM10DoT ! One of the key features of Twitter is that unlike other platforms such as Facebook or LinkedIn, following is not necessarily reciprocal – the people you follow may not be the people who follow you (although they may be!). Some people have a more-or-less even match of followers and following; others follow lots of people but don’t tweet much themselves and therefore don’t have many followers; and some Tweeters, usually very well-known people or institutions, may have a large number of followers as they tweet a lot but don’t actually follow many people, using Twitter more as a broadcast medium to get their message out there. As an individual early career researcher, you’re probably going to get the most benefit in the first instance for the first option, having roughly the same number of followers and following. Twitter works best as a dialogue, and this won’t happen if you’re doing all the talking, or have no one to talk to! How many people you follow is up to you, although perhaps 100 is a good number to aim for, to ensure a useful stream of content. Think about what sort of information you want access to, and what sorts of tweeters are likely to offer it (see the list below for some suggestions). It is an organic process and will take time to build up, and don’t forget that you can always unfollow people if the content they tweet is not useful to you! There are ways to find out if you’ve been unfollowed, but there is no automatic alert and generally people don’t bother!. At this point, it would be useful to know who else is participating in the programme, so I’ve compiled a list of participants – everyone who sent the tweet I suggested yesterday, so you can find and follow each other! Here are ten more suggestions (not exhaustive!) to build a useful feed of information that might work well for you as an early career researcher in the sciences. 5. Academics in your field Search for people you know to see if they have a Twitter account. Look for both more senior academics and peers (PhD, PostDoc and junior lecturers). Search by name or by keyword, or import contacts from your LinkedIn account or email. 6. Research Centres in your field, both here in Cambridge and elsewhere, for events and news. 8. Public Engagement Following the university’s public engagement teams and other researchers interested in impact will help you be aware of events which you might volunteer for, or interesting ways to present research to other audiences. Try @camscience or @NakedScientists. You could also follow commentators such as Ben Goldacre or Simon Singh. 9. Associated Services and professionals There are lots of people on Twitter who can feed you useful information, but aren’t academics. You could follow @jobsacuk for jobs and career-related articles, or university services such as your department library (for example, @CJBSInfoLib) for news, tips and updates. 10. Industry and other sectors To keep an eye on developments in the sector, possible future impacts and applications of your research, or developments which might affect what you’re working on, you could follow some of the professional bodies or companies which represent the types of sector related to your research. Snowball – look at the profile of the people you’re following – who do they follow, and who else is following them? 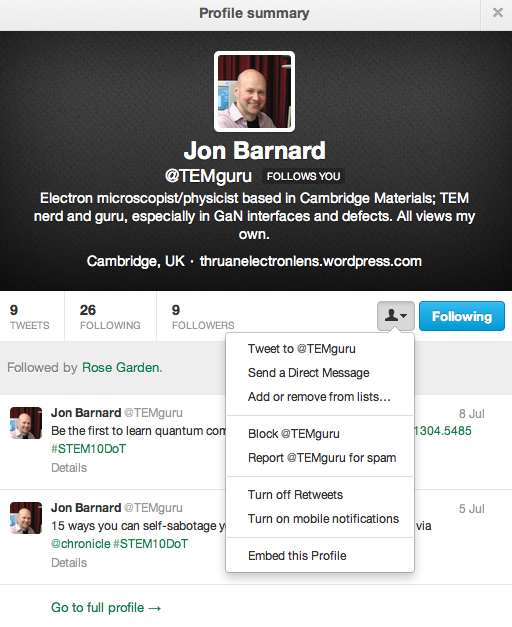 You can see who’s following you, or anyone else, by going to your or their profile, and clicking on ‘followers’. If you suspect one of your new followers is spam, you can ‘block’ them using the head icon next to the ‘Follow” button, and selecting ‘block’. Twitter only allows you to send 140 characters, which doesn’t seem much. Academics almost always write at length about complex ideas, so it’s difficult to say something meaningful in such a short amount of text. But that doesn’t mean that Twitter is superficial or only used to tweet about frivolous things. Many researchers who are new to twitter aren’t sure what to say, or why updates about whatever they’re doing would be interesting to others. But there are actually many aspects of your day-to-day work that would be of very practical use to others. Have a look at some Twitter feeds from academic tweeters and see what kinds of information they share, to get an idea of how you really can say something useful and engaging in 140 characters. This bit is important! For this second Day of Twitter, as your first message, please send the following tweet- we’ll explain why later! Joining in #STEM10DoT with @scholastic_rat! Over the next week, we’ll be sending the following ten types of tweets. For today, though, send a few of the first type of tweet over the course of the day, using the suggestions above. You could also include the hashtag #STEM10Dot in your tweets – again, we’ll explain why later! A simple message – what are you up to? What kind of event or activity might your intended following find interesting, personable or quirky? You could let them know about an upcoming event they were unaware of or might also be present at, a thought about your research or work that’s just occurred to you, or just show that you’re approachable and share common experiences. Don’t agonise over it though – Twitter is in many ways ephemeral! An @ message directed to someone. Ask someone a question, comment or reply to one of their tweets, thank them for a RT or welcome a new follower. NB – don’t start your tweet with the @ sign, as then only the people that follow both of you will see it! either include their @name later in the message or add a full stop . @ before the @ if it’s at the start. Send a direct message (DM) to someone. What kind of message would need to be private in this way? A link to something interesting and relevant you’ve read online, or link to a journal or book. Shorten it using Twitter’s automatic tool or a separate one such as tinyURL, bitly or Ow.ly Add a bit of context or comment on it! Tweet a link to something you’ve shared online recently- a profile update, slides from a conference presentation, handouts from teaching or public engagement event. Many platforms can be set up to do this automatically when you update, such as a blog, slideshare, Storify, LinkedIn, etc. Add an engaging and contextualising comment! A retweeted, quoted tweet from someone else. Don’t just use Twitter’s retweet button – start with your own comment, then add RT and the @name of the originator or retweeter. Livetweet an event of some kind, even if only for 10 minutes. You might try a research seminar, conference presentation or lecture. It’s polite to ask permission from the speaker. See if there is a hashtag for the event and if so, use it. Practice summarising the event and distinguishing your comments from the speaker’s. Take part in a livechat on twitter. #ECRchat and #PhDchat are popular ones. If you can think of any more academic uses for Twitter, then do add them in the comments! Ultimately, your tweets will look a bit like this, but we’ll work up to that!